MASCOT carries a variety of very practical and durable shorts with holster pockets, which are perfect on warm work days. For example, if you work outdoors at a construction site on warm summer days, the MASCOT shorts with holster pockets are ideal. With MASCOT shorts, you don’t need to compromise on durability, functionality or comfort. The MASCOT shorts with holster pockets are extremely durable. The pockets are reinforced with the durable CORDURA® and puncture resistant Kevlar® so pointy and sharp tools do not puncture the bottom of the pockets. The durable materials provide extra long durability, even if you use the pockets for storage of heavy and sharp tools on a daily basis. The shorts have a wealth of practical pockets, just as you know from your work trousers. You will find, among other things, holster pockets, thigh pockets and a ruler pocket. In some styles, the holster pockets have magnets added for the retention of nails, screws and drill bits. When you choose shorts with holster pockets from MASCOT, you get a pair of shorts that are comfortable and that you can easily move around in. Among other things, you will find shorts with holster pockets featuring inserts of elastic stretch material. 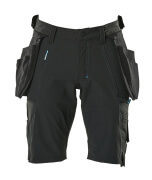 You will also find a pair of shorts with holster pockets of four-way stretch. The material is elastic in all directions and gives you a unique freedom of movement where nothing tightens or bothers during the work day. Common for the shorts with holster pockets is that they all have a form-cut waistband that supports the movements of your body regardless of your working position. In this way, you achieve the best comfort and freedom of movement throughout the work day.